As you can see, the dark chip in the bathtub was glaringly obvious against the surrounding white porcelain surface. This image was taken after the porcelain chip repair service was performed. What a difference! In a beautiful home on the Long Beach Barrier Island, just south of Long Island, there was a white porcelain enameled steel bathtub with a pretty significant chip in the porcelain. The homeowner called for a FREE estimate and then scheduled services. 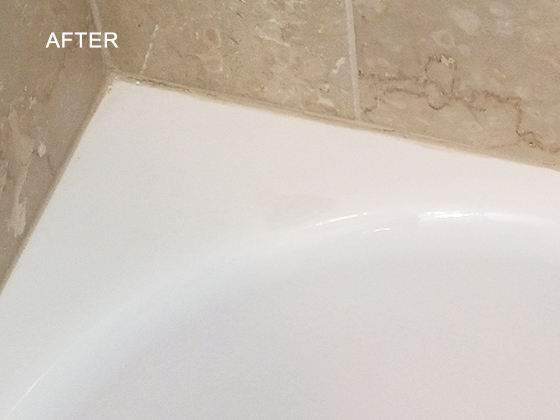 Our first step was to sand, clean, and thoroughly dry the chipped area, being careful to avoid scratches on the surrounding porcelain surface. 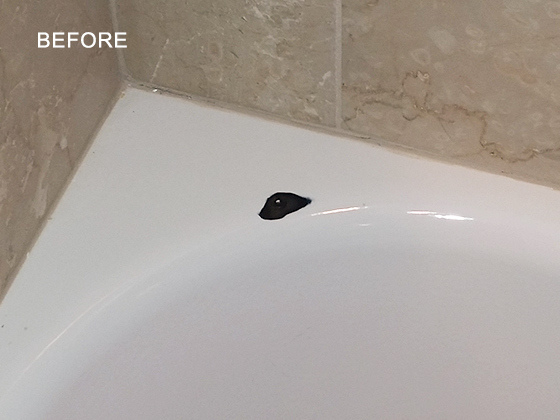 Then we prepared a porcelain repair compound of resin and high-gloss tint to seamlessly blend the color of the repaired area in with the rest of the tub and applied it to the chipped area. After allowing ample dry time, we cleaned the repair site with acetone. Now, only we and the homeowner will ever know there had once been damage to the tub. For a FREE estimate on bathtub chip repair in Long Beach and throughout NY, NJ, and CT, contact us online or call today. We have 3 numbers to choose from 212-777-4040 | 718-776-3564 | 516-377-0993.